Two publicly-owned transport providers have announced new lower emission bus services, cutting pollution and costs. In January, Nottingham City Transport plans to launch what the city council said were the UK’s first all-electric Park & Ride services, with 13 new fully electric single decker buses. One service will run will run along the country’s first Eco Expressway, which gives priority to electric vehicles. The £3.2m cost has mainly been met from Department for Transport’s Green Bus Funding Round and Nottingham City Council’s Workplace Parking Levy (WPL). The council said its existing fleet of 45 electric buses has generated fuel savings of £300,000, reductions in carbon emissions of at least 1,050 tonnes and improved air quality since 2012. The whole electric bus project has cost more than £15m, with a third coming from the WPL and the rest from external government grants. Nottingham will shortly be consulting on plans to introduce a Clean Air Zone over the next three years, taking in over 100 bus stops and two bus stations across the city centre. This will aim to set a minimum entry standard, with ultra-low emission standards for sensitive areas with high pedestrian use, by 2020. 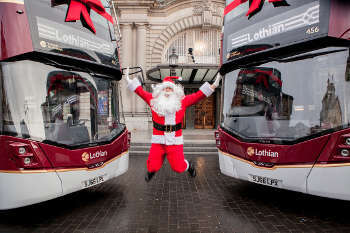 In Edinburgh, Lothian Buses has taken delivery of 25 new buses for one of its busiest routes. The company, which is owned by local councils, said the Euro 6 double deckers will reduce Co2 emissions by 30%, nitrous oxides by up to 98% and particulates by around 80%, compared with the existing fleet. The company said it has removed 900 tonnes of Co2 from its annual carbon footprint with new vehicle deliveries during 2016 and that by the end of the year 66% of its fleet will be at Euro 5 emission standards or above. Its environmental programme has seen over £44m spent on hybrid and Euro 6 vehicles since 2011, with support from the Scottish Government’s Green Bus Fund. The firm currently has 85 hybrid vehicles and will now have 92 Euro 6 buses.